Anatomy of a Car Battery: What’s Inside? Battery Terminal/Bushing: The terminals are connected to the positive strap and the negative strap of the end cells, and are the interfacing point between the battery and the vehicle's electrical system. Battery Acid: The acid is a high-purity solution of sulfuric acid and water. Cast-on Strap for Batteries: The cast-on straps are welded to the top of each element to provide an electrical connection to the terminals. Battery Negative Plate: The negative plate contains a metal grid with spongy lead active material. Battery Separator: The separator is a polyethylene material that separates the positive plates from the negative plates to provide an efficient flow of electrical current. Positive Battery Plate: The positive plate contains a metal grid with lead dioxide active material. Lid on Battery: The lid is made of polypropylene resin and sealed to the battery case. Battery Case: The case is polypropylene resin, which holds the battery plates, cast-on straps and electrolyte. It's designed to minimize vibration impact and extend battery life. 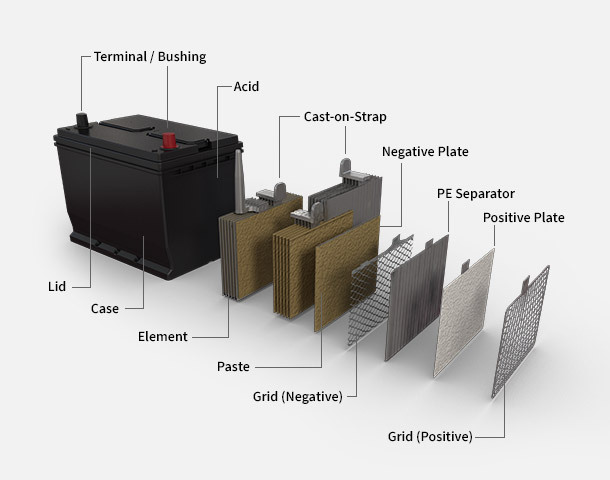 Battery Plates: The element consists of stacked alternating positive and negative plates. The plates are connected at the top by a cast-on strap that is welded to the plates. The elements fit into the individual cells of each battery. Battery Paste: The paste is a lead oxide mixture that creates both lead dioxide and sponge lead. It adheres to the positive and negative battery grids.